For those who come home late at night and fumble to find the right keys; for those who have an external garage that does not have a wired electricity facility and want an external light source; for those who desire to simply stroll outside the home after dark ... Motion sensor outdoor lights can greatly enhance both safety and comfort to a home. A powerful light triggered by motion is probably the first line of defense in protecting your property. A well lit premise tends to deter all but the most determined burglar. The motion of someone walking up to the door automatically turns this bright security light ON for 30 seconds to 10 or so minutes according to the choice of its owner. Normally, motion sensor outdoor lights have a 180 degree, 30 foot range and some have adjustable brightness levels. The lights activate only when movement is detected from up to eight feet away and turn off automatically after an adjustable delay period. The battery operated motion sensor light which uses bright white LED (light emitting diode) light can stay on for just about 30 seconds to conserve the battery. These lights could be used anywhere for night time illumination, be it deck steps, fence gate or indoor stairwells. These sensor lights are weather proof (Check that they have IP67 rating)with plastic housing. They usually run off batteries which last about a year. The lights are battery operated and there is no wiring or cords most of the time. The lights also have two brightness levels and motion-activated dual lights come on when movement is detected. The head swivel is adjustable on a 180 degrees angle. There are dusk/dawn modes, when lights come on at night and turn off during the day. Primarily there are two types of motion sensors, namely active and passive sensors. Most outdoor lighting uses passive detection. This system is set to detect the temperature of a human body which radiates infra red energy between nine and ten micrometers and hence its capacity to detect IR energy. The heart of a motion sensor is PIR - Pyroelectric Infra Red sensor or Passive Infra Red Detector motion sensor which uses a solid state chip. Along with a plastic fresnel lens or multi segmented mirrored front, the internal chip with control electronics detects motion across their field of view. The position of these sensors is critical to effective functioning. Even the movement of a cat can trigger it. Passing automobile's headlights can trigger too. On the other hand, if the sensor is positioned in a place facing a source of heat, it can make the sensor less sensitive to detecting human movement. Dust on the mirrors or usually on the fresnel lens which collects the infra red energy can reduce the sensitivity. So it is perfectly natural if you have a PIR type Motion Sensor Light to have reduced sensitivity during the summer while it will have better detection range in winter. So careful positioning of the sensor is important to have optimum sensitivity. The active sensors on the other hand are based Microwave sensors. A change in the return of the energy to the unit triggers the sensor. They normally use low powered (less than 10 mW or so power level) chip which generates microwave in 5.8 GHz frequency. The movement of any object in its field of vision will result in Doppler shift that in turn triggers the switch. As a result, this type of Motion Sensors is not affected by temperature or random movement of a body of air. But MW motion sensors can be easily triggered by even a small animal or falling of leaves. Thus, Microwave Motion sensors are usually restricted to indoors or closed spaces where they act as Occupancy Sensors. 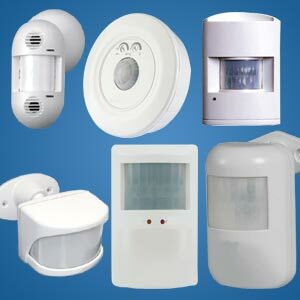 The motion sensors can also be remote controlled which offers added safety and convenience. This system carries all the features like any other motion sensor outdoor light with an additional remote control to activate the light from inside the house. The solar sensor light is another solution to provide practical light for security reasons. This light turns on automatically when the motion is detected and off after a minute. Since the battery is powered solely by sunlight, there are no wires required. This is ideal for emergency use as one can simply rely on this handy object all year round. Solar powered units also feature backup battery packs which require no hard wiring. Solar powered units provide a sense of comfort and security at night and this light fixture is a popular choice for its efficiency and versatility. Solar Powered Motion sensor outdoor Lights can range from tiny 1 W LED type to a large High efficiency 15 W LED or above for lighting up garden way, drive path and fences. They require little maintenance for years. They need to be cleaned periodically to keep them efficient. Dual flood light with built-in motion sensor is the perfect solution for an existing flood light outdoor. Another ability of this motion sensor flood light is to control additional lights. If this light is enabled, it can trigger other lights at home and in the yard whenever movement is detected. This way the entire interior and exterior of a home automatically lights up during an emergency situation. Motion sensor outdoor lights with bright LEDs make a great safety feature to steps and entrances of homes. It is often construed as a first line of defense against any house break or home intrusion. This is an inexpensive source of installing security lighting. Motion sensors are proven to be economical as the light only stays on for the length of time set by the owner. One need not worry about turning a switch on and having to remember to turn it off again as it is taken care of. Most packages of motion sensor outdoor lighting come pre-wired and they can be installed as a do-it-yourself project without much expense. Most of them have the motion sensor mounted below the primary two security lights to have the largest field of view possible. This motion triggered light systems also come with the feature to be manually turned on by the home owner for general lighting. Strategically placed motion sensor outdoor lighting can provide peace of mind that no intruder can pass by the home unnoticed. First Published Date: 23 Jul 2009 Last modified Date: April 18 2019 This page may have been updated recently as new information is available or the content may have been edited for better readability.